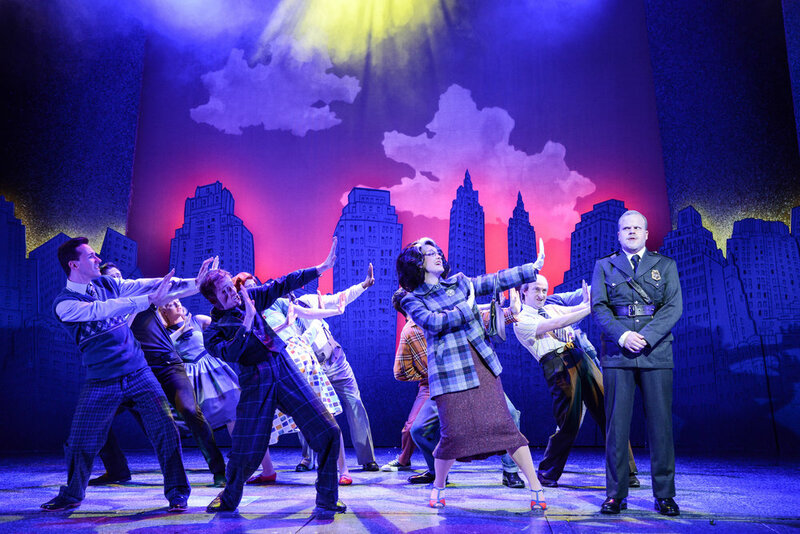 I’m pretty sure British theatergoers have seen a resounding revival of classic farce in recent times, both in London and across regional theatres. In the years since the revival of Richard Bean’s “One Man, Two Guvnors” back in 2015, I’ve noticed a resurgence in the genre that combines slapstick with endless gags in a bid to bring the auditorium roof down. As luck would have it, then, the new revival of Mischief Theatre’s “The Comedy About a Bank Robbery” has just rolled into the Leeds Grand Theatre. Unlike its contemporaries, including its successful predecessor “The Play That Goes Wrong” penned by the same minds, “The Comedy About a Bank Robbery” swaps the British backstage for 1950’s Minneapolis. The basic gist is: Sam Monaghan (Dave Hearn) finds himself in the middle of a madcap plot by a recently escaped prisoner bent on robbing a prized diamond from a Hungarian prince, on its way to the Minneapolis City Bank for safekeeping. A with any great farce, there’s a whole lot more details to unravel thrown in for good measure, but you’ll have to catch the show yourself to discover. What you’ll also discover upon watching “Bank Robbery” is a smart, silly, stylish and excellent slice of physical farce that will have you laughing until the end. I’ll admit after the first few gags I was skeptical of where the show would lead and if it was just going to be bland and formulaic, but as the momentum built it was clear to me that this crazy production was in fact a dynamic and marvelously executed theatrical powerhouse. So what makes “Bank Robbery” unique? Well, it’s got all of the core components one can find in a modern farce, including high-energy, dedicated character portrayals and a slick set design that serves its storytellers well. Yet, what makes this piece so different is the rise in its momentum as its execution unfolds. The well-penned jokes, often including the type of puns that are so dreadful that they’re comedic gold, and the physical comedy sequences that ignite the fuse on the comedic powder trail laid out by the writers build up such momentum that it’s impossible to take your eyes off the action. This momentum finds its way into everything else across the piece, charging the storytelling language of the piece with a comedic truth that, in its absurdity, makes complete, logical sense throughout to great effect. I mean, where else would you find live surreal 50’s Doo-wop backing a car chase with a car made out of a laundry basket? The ensemble of performers inhabit their roles well, with Hearn’s pick-pocketing protagonist leading the charge with physical, dynamic and responsive storytelling. The whole company, including David Lynch as bank manager Robin Freeboys and Julia Frith as his daughter Caprice, bring endless energy and dynamism to their roles. They all come together to present a show that never faces the possibility of running out of steam and rises up to be one of the most memorable farces on the English stage in recent years. Allowing the performers to work their magic is the scenography of a cracking team of designers, which comes together to tightly bind the play-world together and streamline the storytelling. David Farley’s set design brings innovation to the fore, particularly in the second half, where we see just how stylish and clever this piece of theatre is, with a whole sequence where the comedic language shifts its focus to this ingenious set design and some of the most explosive laughs are found – that’s all I’ll say on that one, since by now you’ll already have a desire to catch this show on its tour. Completing the scenography are David Howe’s slick, atmospheric lighting design and Jon Fiber’s sound design, which sonically captures the madcap world with flair and ease. With endless laughs and smart, innovative storytelling, “The Comedy About a Bank Robbery” offers up a seriously enjoyable piece of physical farce that sets the bar high in the comedy theatre arena. Firmly cementing itself in a lineage of great English farces, this is one piece you don’t want to miss.